Although total joint replacement (TJR) is amongst the most successful and beneficial medical procedures to date, long-term outcomes continue to suffer from aseptic loosening secondary to periprosthetic osteolysis. Extensive research over the last two decades has elucidated a central mechanism for osteolysis, in which wear debris generated from the implant stimulates inflammatory cells to promote osteoclastogenesis and bone resorption. Osteolysis can be found in up to 20% of patients ten years after primary surgery, leading to implant failure and need for revision arthroplasty, which has a poorer clinical result and a shorter duration of survival, compared to primaryTJR. As a direct consequence of these failures, many younger people who would otherwise be excellent candidates often postpone surgery. Thus, there is a great demand for a therapeutic solution to this problem, which is long over due. 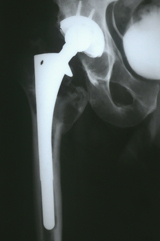 X-ray of osteolysis around a hip implant. Over the last ten years we have focused on the cellular and molecular events that govern wear debris-induced osteolysis. While much of this work aimed at elucidating the osteoclastic response to wear debris, it is now clear from in vivo animal and clinical data that periprosthetic osteolysis results from uncoupling of the osteoblastic remodeling response. This theory is consistent with the clinical observation that all TJR patients experience wear debris-induced bone resorption, but only a few sustain pathologic osteolytic lesions. Thus, our current focus is aimed at understanding the chemical and physical parameters of ultra-high molecular weight polyethylene particles (UHMWPE) that lead to uncoupling. To this end, we developed the first in vivo volumetric osteolysis outcome measure for the mouse calvaria model of wear debris-induced osteolysis using longitudinal micro-CT. Currently, we are using this animal model to define the osteolytic vs. osteogenic properties of various UHMWPEparticles and evaluate novel interventions for aseptic loosening. 3D micro-CT image of wear debris-induced osteolysis in mice. Histology image of wear debris-induced osteolysis in mice.